A Cloudburst is a novel idea. It’s an online discussion focused on a word cloud. Everyone chimes in to contribute their ideas. Take a look at this word cloud I made about Software Requirements. Add your thoughts to the discussion in the comments below! What do you think? Do you work with software requirements – either suggesting and submitting them, writing and qualifying them, or putting them into code? Which of the ideas in this word cloud speak to you? Are there some you strongly agree with? Are there concepts that are missing? Anything here you think doesn’t fit? Does more need to be said about some? Which ones weren’t obvious to you at first but you’ve come to value their importance? Check back in to learn what others are saying about software requirements. 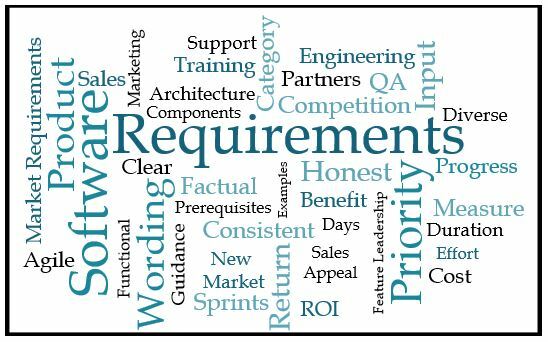 I like how this word cloud does a nice job of bringing in the many factors involved in requirements, from wording to priority to the many sources of ideas for new capabilities, from channel partners to customer support. It’s also interesting to see the importance this word cloud gives to using clear, consistent, factual wording for requirements. I’ve found that clear, factual wording – with examples where appropriate – is the way to efficiently take requirements from a jumble of wishes and complaints and turn them into workable instructions for software programmers. Sign up to receive any summary and analysis I do of this discussion, and to get new ideas on software product management in your inbox from time to time. There’s a signup form near the top right of the page. On a mobile phone, it appears near the bottom below all comments. When it comes to the idea of figuring out the ROI of requirements, my experience has been that it’s a good idea which is just too hard to execute. Instead, I have gravitated towards specifying a Benefit, a softer, less numbers-based version of ROI. Even when you can’t get specific about the dollar value of a requirement, you can express a Benefit which makes it clear to all involved why a given requirement is being requested.